New Facebook Page Layout Rolls Out on Desktop: This week, Social Media Examiner noted the rollout of a new Facebook page layout for desktop users. The new layout features customizable sections in the middle column, new templates for different business types with various tab options, and an easier way to see and share the unique URL for each tab. 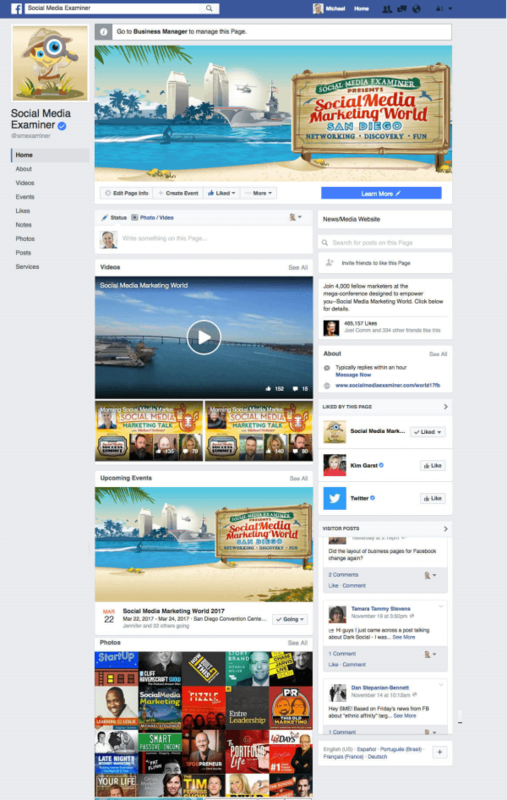 Social Media Examiner noted the rollout of a new Facebook page layout for desktop users. Business Manager users can update their Facebook page with the new layout by going to Settings, and then clicking on Edit Page. It appears that Facebook is still testing different features on various pages and has not yet rolled out these changes worldwide. 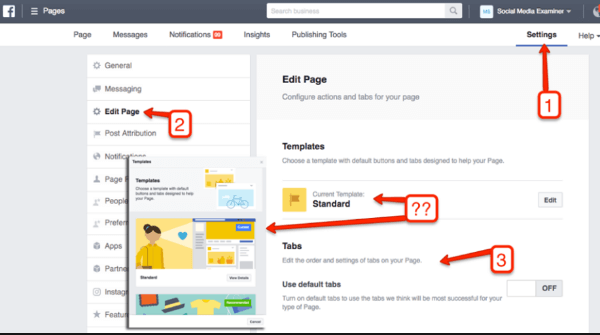 Here’s how to change your Facebook page layout using Business Manager. Instagram Adds Disappearing Photos and Videos, Announces Live Video: Instagram launched the ability for users to share disappearing photos and videos directly to groups and individual friends “in a spontaneous, pressure-free way” on Instagram Direct. This update “keeps regular direct messages the same and adds a more visual way to connect with your closest friends – all in one convenient place.” Instagram notes that users can only send disappearing photos and videos to people who follow them and vice versa. This new feature is widely available and is rolling out globally. Facebook Eliminates Media-buying Specialty From Facebook Marketing Partners: Facebook announced that “after careful consideration and in an effort to streamline the program,” it will no longer support the Media-buying specialty for Facebook Marketing Partners and Instagram Partners as of December 31, 2016. According to the Facebook Marketing Partners site, Facebook has found “that the Blueprint Certification, which recognizes an individual buyer’s competency with Facebook and Instagram products, better suits the need of the market and of [its] agency partners” and the network plans to focus its program on partners building on [its] API instead. The Morning Social Media Marketing Talk show with Michael Stelzner is taking a break for the Thanksgiving holiday and will return on Friday, December 2, 2016. Subscribe to future shows here. Periscope Rolls Out Thanksgiving Hearts: Periscope enabled Thanksgiving-related hashtags that activate themed hearts that broadcasters can enable on their live videos. Broadcasters simply need to include #thanksgiving, #givethanks, or #turkeyday in their broadcast titles to allow the Thanksgiving-themed hearts to appear alongside normal hearts as viewers send them. Google Allo Unveils New Sticker Pack: To help celebrate “all aspects of Thanksgiving,” Google unveiled a new animated sticker pack in Google Allo. This new sticker pack is available now and can be downloaded from the sticker store in Google Allo on Android and iOS. Google unveiled a new sticker pack in Google Allo to help you celebrate all aspects of Thanksgiving. Facebook Tests New Nearby Public Wi-Fi Feature: The Next Web reports “Facebook appears to be testing a new feature that lets you find nearby wireless hotspots.” Facebook recently asked page owners to list open Wi-Fi locations at their physical addresses in an effort to identify places with free public networks. Facebook confirmed to Mashable that this feature is currently being tested in select countries. Instagram Launches College Football Correspondents Program: Instagram is launching a new Correspondents program that promises to “take fans of select college football teams behind the scenes.” Adweek reports that “one student ambassador at each participating school will take over that school’s Instagram account and use Instagram Stories to share their experiences.” Each participant is selected through an evaluation process and will get “to show off their work” at one game. The best participant, as judged by the Instagram team, will take over the main Instagram account, with its nearly 200 million followers, for the upcoming NCAA National Championship Game. According to Adweek, this opportunity is currently limited to seven participating U.S. colleges. The 2016 State of Social Business: “To gain a comprehensive understanding of the current state of social,” the Altimeter Group surveyed more than 500 global social strategists on the current key success factors for social business and how the industry will continue to evolve. The study highlights the continued shift to “customer centricity” with 82% of those surveyed listing customer experience as their top priority for the first time. The study also explores how social teams are balancing the role of innovator versus connecting the existing centers of excellence in ecommerce, advertising, and content. Seventy-nine percent of strategists say they’re becoming more “operational and a platform for the innovation of others,” rather than being the innovators within their organizations. Measuring Marketing Insights: Harvard Business Review compiled a collection of 32 articles on how leading marketers are “turning today’s mountains of multi-channel data into real insights and action.” The articles explore a variety of analytics and market research topics such as rethinking marketing measurement, using data to create value for customers, and data science strategies for businesses. The report also identifies the four key components successful companies have adopted when it comes to measuring the customer journey. 2016 State of Customer Journey Marketing: Autopilot’s second annual State of Customer Journey Marketing surveyed 505 marketers on where they’re “investing, winning, and failing.” This study examines the ways high-performing marketers are growing their revenue; the rise of the online customer journey; and the trends, challenges, and predictions for 2017. One insight gleaned from this report indicates that 71% of high-performing marketers have defined an initiative to map the customer journey, which shows the importance of focusing on sales funnel strategy, not just on customer acquisition. The Science of Social Video: Brightcove commissioned research firm Vanson Bourne to examine “changing social video engagement habits and preferences” and determine how branded videos on social media drive consumer behavior across the buying cycle. More than 3 in 4 of the 5,500 adults from UK, France, Germany, U.S., and Australia surveyed report that they regularly interact with brands on social media and almost half (45%) of those surveyed watch branded videos on social media. The report identifies the key drivers to branded video engagement such as relevance to the respondent’s interests and quality, and explores what specific factors can turn viewership into sales. YouTube remains the preferred destination for viewing videos, followed by Facebook. Evaluating Information: The Cornerstone of Civic Online Reasoning: According to a new study from Stanford University, more than 80% of students from middle school to college are unable to tell an advertisement (labeled as sponsored content) from a news story. Furthermore, the survey reveals our “future decision-makers” are currently unable to identify what is and is not a “useful source of information” in terms of online news and photos. The report proposes next steps for correcting this issue through curriculum development, assessments for learning, and awareness. What do you think of the new live video and disappearing photos and video features on Instagram? Have you seen the new Facebook page layout? Please share your comments below. 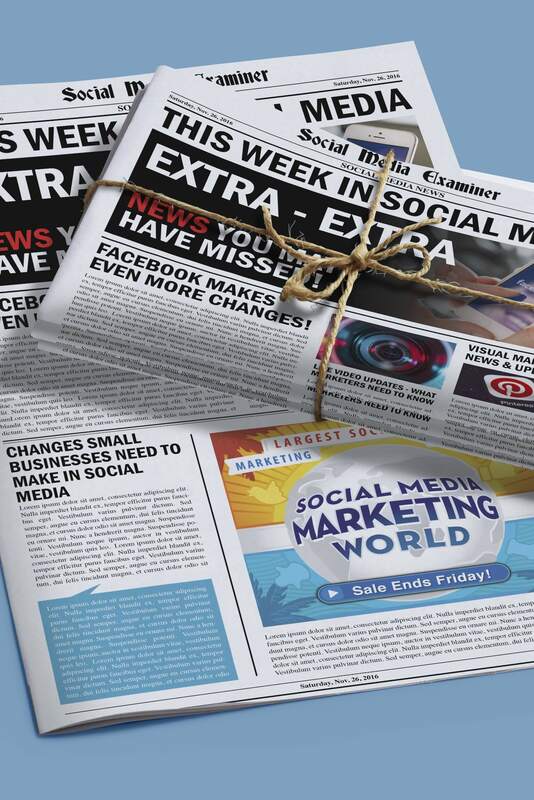 Facebook Changes Page Layouts and other social media news for Nov. 26, 2016.